He has said all this before, but here goes the Master on reading and writing, and sounds as refreshing as ever. 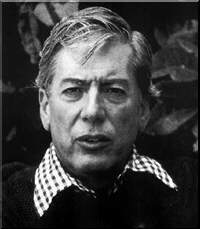 While offering an escape, Vargas Llosa says, fiction also has the ability to spark rebellion within a life. To explain the difference between literature as fantasy and as agent of change, he mentions two famous fictional characters who are themselves readers. “Madame Bovary doesn’t read masterworks. She reads … pulp fiction. That’s what she reads: pulp fiction, love stories, very banal, very superficial. But these stories disturb her profoundly, because they give her the idea of a very different kind of life. A life of pleasure. A life of romantic deeds. A life in which women become heroines, martyrs. Romantic martyrs of love. “And so what does she do with all this? She does exactly the same thing that Don Quixote does when he reads chivalry novels. He thinks life is like life in chivalry novels! … In the case of Madame Bovary it’s tragic. That’s the hallmark of great literature. …no wonder Llosa happens to be my favourite writer!